During the latter part of the 18th century, as a result of the Industrial Revolution, many areas of Great Britain went through a period of considerable change. A new surge of communications stimulated growth in Hertfordshire. 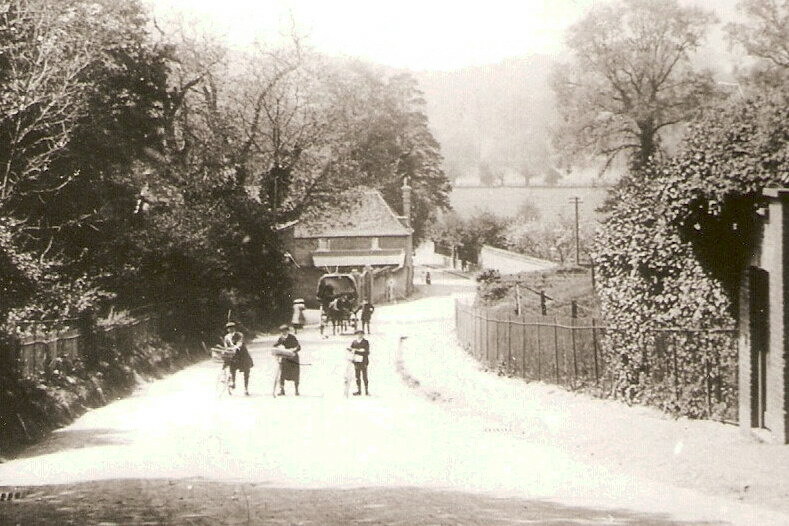 The Turnpike Trust improved main roads and this led to an increase in stage coach travel. These improved highways brought about major trade potential and the disposal transportation of products. In parallel, the development of new waterways – canals – such as the London to Birmingham Grand Junction (Union) Canal, became a cheap method of transporting bulky raw materials and finished products. It was also a time when the country was seeing the development of steam power. This was significant because it provided opportunities for rail connections to large towns. 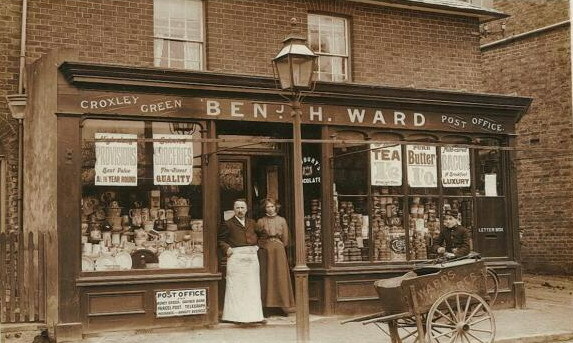 It is Croxley Green’s proximity to London (some 17 miles) that might explain the historical development of paper and the printing industry in the area. 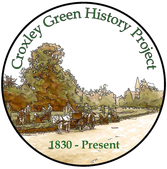 Consequently, all these changes gradually impacted on Croxley Green and with Watford, a fast progressing market town, just a few miles away it seemed inevitable that the landscape would start to change. 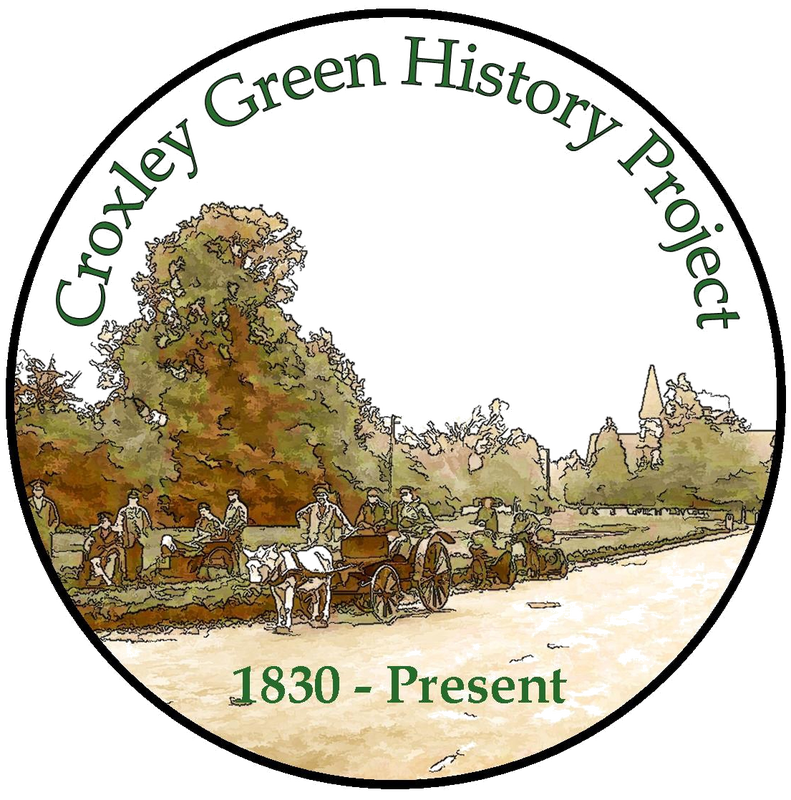 Old maps of the time will show that there was a scattering of small farms and cottages that were utilising the land in and around Croxley Green. The land then supported mixed farming with arable field crops of cereal and vegetables as well as livestock of pigs, sheep, cows and chickens etc. Southwest Hertfordshire was also well established and well known for its orchards and in particular cherry orchards. Now that the village had routes passing through it and such was the countryside with its attractive woodlands and rivers, it was an ideal place for the landed gentry to build substantial homes. Much of the land previously owned by Gonville and Caius College was quickly moving into private ownership. 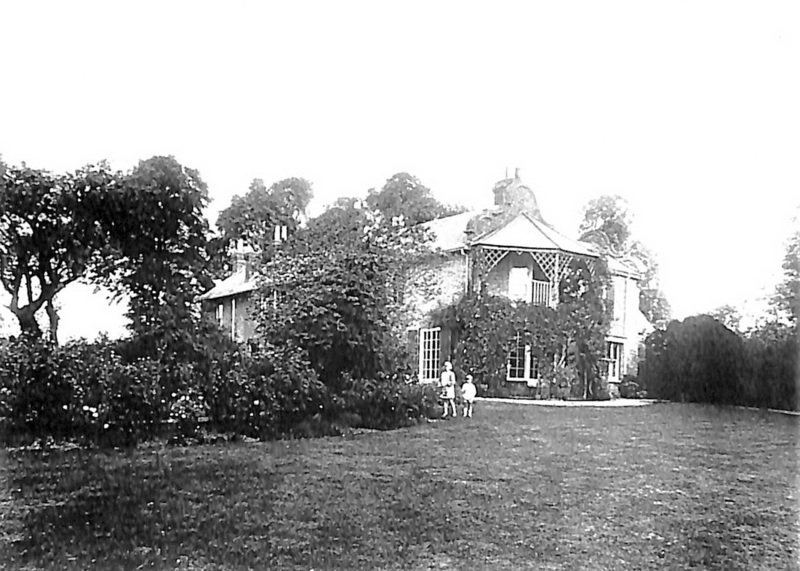 The Woolrych family found Croxley Green an idyllic spot and purchased Croxley House from Thomas, Lord Hyde later the Earl of Clarendon in 1794. The house had been enlarged by a previous owner and a stone wall built to encompass the 14 acres. A well was sunk in the grounds to provide fresh water in common with many houses at the time. The Woolrych family once settled purchased Parrotts Farm close by and in the1920’s the family made a decision to reside there and let the house. 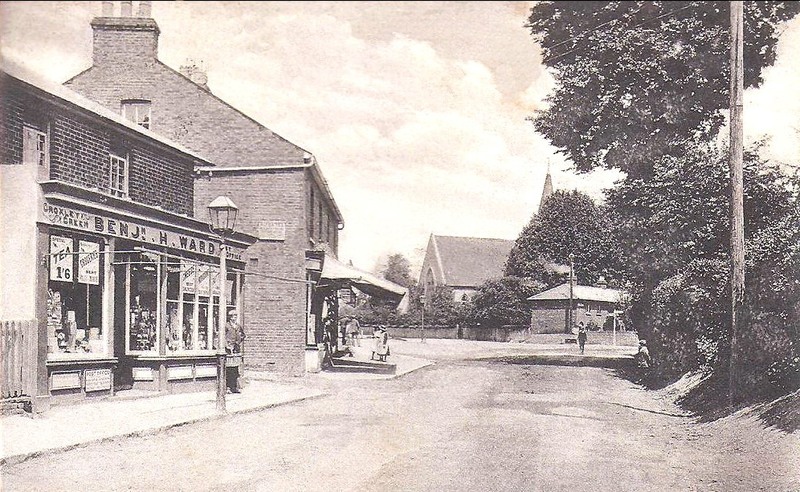 It would appear that the family was impressed with Croxley Green as a close family member, Miss Mary Bentley, Aunt to the Woolrych family also came to the area and had a large house built a few hundred yards away on the edge of The Green which she named Bathanna, The Pavilion. Requiring accommodation for a coachman and a gardener she had two cottages built close to Parrotts Farm. The bricks were reputedly taken from an old Dissenters meeting house on a stretch of road known as Chapel Lane. The meeting house had been registered in 1816 and Nathan Sharman was the Minister. For some time too Miss Bentley owned the nearby Killingdown Farm. As the house changed ownership so did the house name and it is more familiarly known as The Grove. (Miss Dugdale having also been an occupant) The house came into the ownership of TRDC was subdivided into flats and has once again been sold privately and is now private apartments. 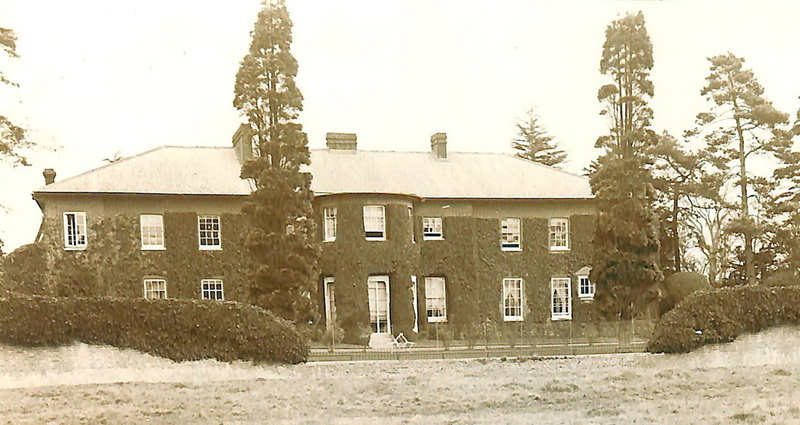 Scotsbridge House, Scots Hill House, Durrants House, Cashiobridge House, Redheath, Micklefield House, Highfield House were properties that also had prominence in the district. Cassiobridge House once stood on the land bounded by Baldwins Lane, the track known as Lodge End, Rousebarn Lane and the Grand Union Canal. Since my arrival in Croxley Green, to my knowledge these fields have only provided grazing for ponies except when used briefly by locals for unofficial tobogganing down their slopes in snowy weather! At the time of writing (2018) this land is being developed for a new school, Croxley Danes. As the site is changing out of all recognition, I thought it timely to gather information about the former estate, especially as the historic record seems lacking, probably because the estate was not grand enough nor the house considered of sufficient architectural interest, although it did boast two ornate Dutch gables (also reflected on a smaller scale above the front door) and a lofty canopy presumably over a balcony outside the master bedroom. Long before, a medieval manor house called Snells Hall House existed nearby but this had disappeared by 1587. On the 1766 Gonville and Caius College map of the Manour of Croxley and Snells-Hall only field names lend a clue: “Snells Hall” and “Snells Hall Garden”. [Those interested in this early history are here referred to the article by Brian Thomson in “Herts Past and Present”, Spring 2018]. Using protractor and ruler to try and pinpoint the site of Cassiobridge House on this 1766 map (on the particular copy as it appears elsewhere on this website), places it towards the top end of “Great Mallets” and in fact, a ghostly “X” can be discerned on the map near this very spot - coincidence? The house was of two storeys with an extensive cellar. Scaling from the largest OS map available to me (1:1250, 1959) my estimate of the main house rectangular footprint is 11m x 23m (36ft x 75ft.). Close by the front were an assembly of 'farm' buildings and greenhouses and to the rear a walled orchard which was a magnet for scrumping by local children. A fine magnolia tree grew in the adjoining garden and outside the house was the almost obligatory cedar of Lebanon, although this does not appear in the photos available but the most impressive feature was perhaps the 250m or so long, lime tree flanked entrance drive to the junction of Baldwins Lane and Watford Road. A portion of this avenue still exists. Since 1557 the freehold landowners were Gonville and Caius College, all subsequent occupants of the house have been leaseholders except one (see below). When was Cassiobridge House built? There are no corresponding buildings on the 1776 map but what appears to be a house (unnamed) and outbuildings are present on the 1821 Bryant's Map of Hertfordshire (albeit rather crudely drawn): Brian Thomson has suggested the earliest appearance post-dating 1812. 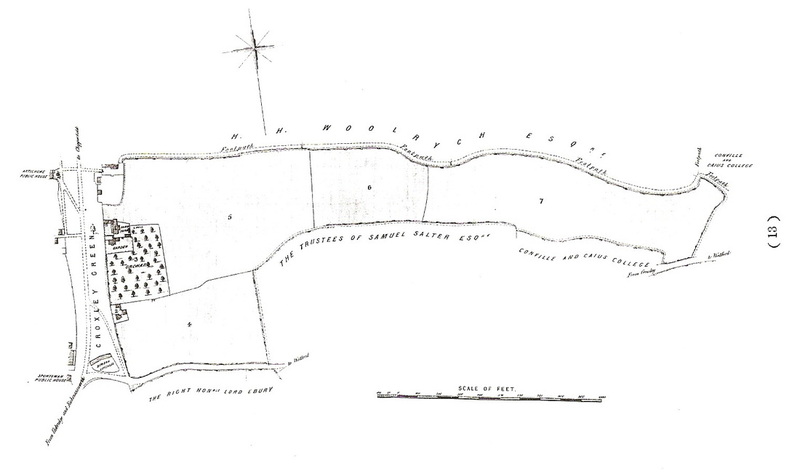 The house then differed as it appears on the Bryant and 1839 Tithe maps as an inverted L shape (but not on the 1828 'Manor of Rickmersworth' map), seemingly in a slightly different position relative to the farm buildings, although this interpretation relies entirely on the accuracy of these old maps. An access route from Lodge End is hinted at on this map but not until the 1839 Tithe map does the long driveway to the “Two Bridges” road junction appear. The 1861 census lists a “Cashio Bridge Farm, Croxley Green” with the occupant as William Fellows Sedgwick and family. This was a notable local family of farmers, surveyors, auctioneers and later brewers who also leased Croxley Hall Farm. Confusion could arise here as there was another Cashio Bridge Farm a mere 500m (as the crow flies) lying just within the Watford boundary, on land belonging to the Earl of Essex. However, by 1871 the Croxley farmhouse was either converted into, or replaced by, a family dwelling for the well-to-do. Significantly, on the 1871 Census the house is referred to as “Cashio Bridge House” for the first time (although not so called on OS maps until 1896) and its occupants were John Thomas White, solicitor and landowner, his wife, three children and one or two servants. By 1881 the occupancy had changed to that of Edward Moon, “merchant” (actually a tea importer), his wife, two children, a niece and five servants; his father was Sir Richard Moon, Chairman of the London and North Western Railway Co. Mr. Moon grew orchids and won awards for his efforts and this is probably why he and his gardener found smoke from the Croxley Mill chimney very troublesome at times. Both gentlemen gave evidence in a court case against the Mill for nuisance. It is understood that the rusty iron fence alongside Rousebarn Lane was erected in 1880 by Moon. Edward Moon died suddenly in 1893 whilst on a grouse-shooting trip in Wales but Mrs. Moon continued to live here until 1900. 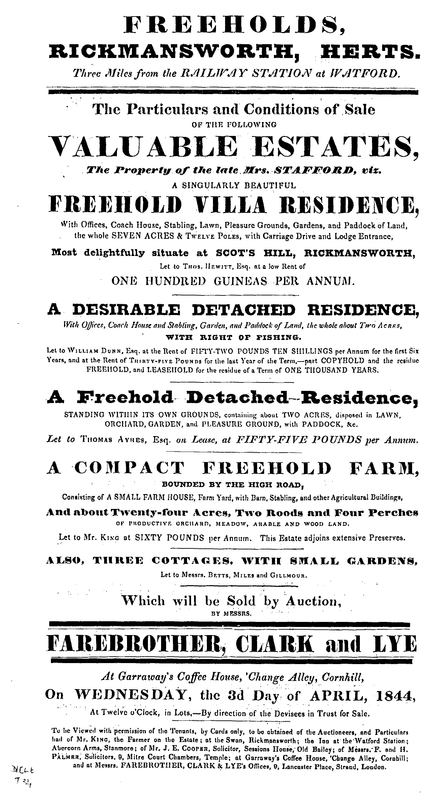 A newspaper advert for an auction of farming stock etc. in early November 1899 mentions nine cows, a sow and nine pigs and a quantity of poultry. It is believed that in 1900 Harding Edward de Fonblanque Cox moved here from Chorleywood House and by 1901 the name had become “Cassiobridge”. The occupants include Mr. Cox, his son and six servants. Mr. Cox initially trained as a lawyer but inherited a share in his father's newspaper and journal publishing business in London but enjoyed dog breeding, riding to hounds and owned racehorses; he published a number of books on dogs and horse racing. Mr. Cox's very short tenure here is explained by his protracted divorce case which was ongoing and his tendency to change abode fairly regularly during this time and it is not surprising that Mrs. Cox's name is absent from the 1901 census for Cassiobridge House. In 1902 Gonville and Caius College sold Cassiobridge House and 44 acres of land for £7,520 to Seymour Walter Greves, a director of a hosiery business in London, who moved here together with his wife Katherine and daughter Daisy (b1889); the 1911 census also lists four servants including a farm labourer. Mr. and Mrs. Greves's son Walter Richard was already married and living at Scots Hill, Rickmansworth. Mrs. Greves died in 1906 and Mr. Greves died in September 1913 but Daisy seems to have continued to reside here in 1915 following her marriage in 1914. Jack Sansom recalls Daisy's love of animals and a pets' burial place close to the Rousebarn Lane boundary. 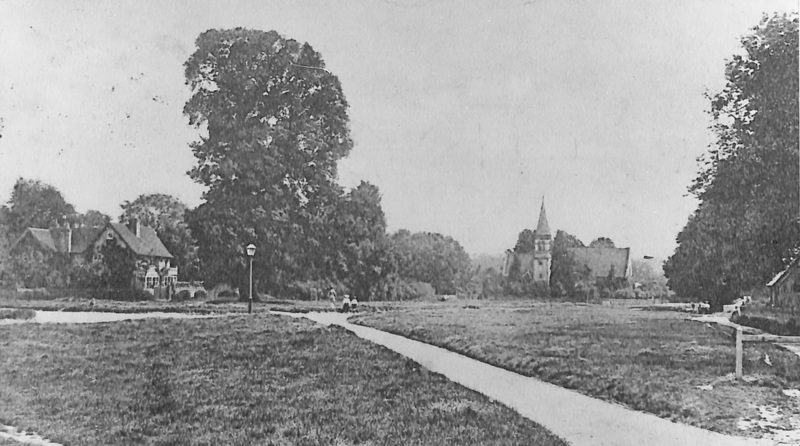 The move of West Herts Golf Clubhouse to its present site c.1911 necessitated a new vehicular access route and permission was sought and obtained for members' motor cars to use the private access way linking Baldwins Lane to Rousebarn Lane (viz. Lodge End and at the time of writing still a track), as this afforded an access to the farm buildings of Cassiobridge House. Reference to one of the 1927 Croxley Mill aerial photos shows a surprisingly prominent thoroughfare, possibly compacted chalk and stone, apparently straighter and wider than now and perhaps not the potholed track of recent years. In April 1913 the Metropolitan and Great Central Railways (M&GCR) had issued a statutory notice to purchase land for extension of the Metropolitan Line. The proposed railway would cut across the main private driveway to the house from where the Two Bridges roundabout is now. Negotiations took place between the railway company and Mr. Greves who, by this time, must have been Walter Richard and apparently, he was found “troublesome”, demanding £10,000 and an ornamental rail bridge over his driveway. Having done costings, the M&GCR decided to purchase the whole estate for £12,500 and remove the need for an extra bridge. In the event, the war delayed matters and the conveyance was only finalised in March 1917 and the railway extension not completed until 1925 - the railway authority remain the landowners today in the form of Transport For London. According to the recollections of Jack Sansom, during WW1 the estate was used by the army for training horses and mules to pull gun carriages. By 1920 occupancy passed to Edwin and Mary Meekings, as these first appear on the Electoral Register in Spring of 1921. Mr. Meekings had been invalided out of the army in 1916 and following agricultural training, established a poultry farm here known as 'Watford Poultry Farm'. 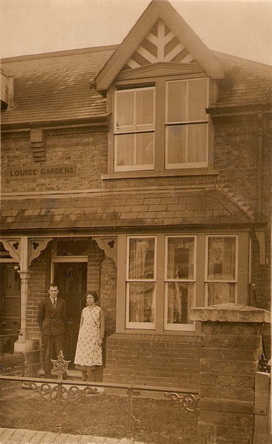 It is understood that in 1924 the lease passed to Osman Broad Gabriel who lived here with his wife Mary Janet and daughter Muriel Joyce (and presumably her younger brothers). Major Gabriel distinguished himself in WW1 as a Captain then Major in the Royal Army Service Corps, Motor Transport and was awarded campaign, gallantry and long service medals. After the war he worked for his father's machine tool import company, Charles Churchill. The 1939 Register omits the Major (probably because he was recalled to the military) but names Mary, Muriel and two staff including a farm manager; two names are blanked but very likely also servants. Regarding agricultural activity, in the 1920s and 30s there was a prosperous poultry farm and an orchard of apples, pears and damsons. There was also a large greenhouse in which grapes were grown. Much information, as well as photographs, were supplied by Joy Crawshaw (nee Muriel Gabriel) in 1987. When did this family leave? According to an entry elsewhere on this website, it was in 1939 when the lease was sold to the Associated British Film Distributors (ABFD) as their headquarters and storage depot, however, it must have been late 1939 as the Register that year was taken on 29th September and the Gabriels were still there. Long after the family had moved away, Major Gabriel made large donations to the RNLI to fund lifeboats for Port Erin, IOM and Hoylake. 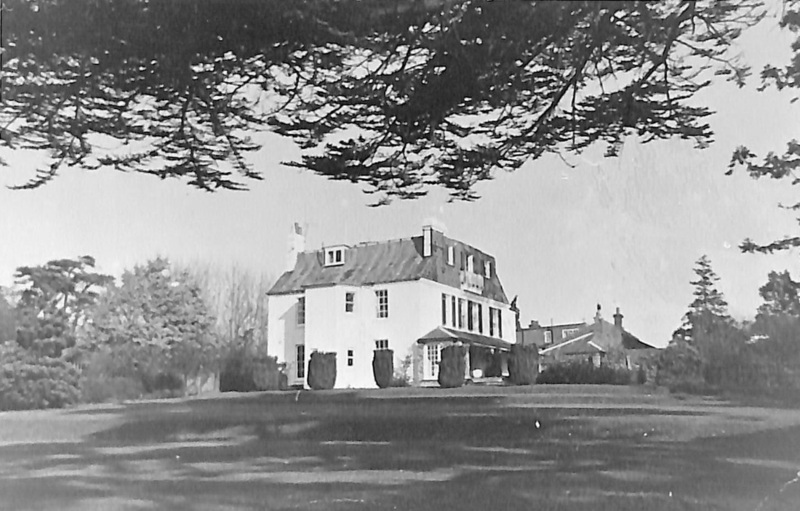 ABFD vacated in the early 1960s but in any case, the house was demolished in 1965 leaving only a few garden walls; according to a letter from Jo and Ray Parsons who lived upstairs at one end of the house from 1959 to 1961, a caretaker Mrs. Clark, lived at the other end. One room had to be kept locked owing to a collapsed ceiling and rotten floor, otherwise rooms were used for the storage of film props, scenery and life-sized pictures of film stars. The place generally was said to be very run-down – no doubt in urgent need of modernisation. The only reminder of 'days gone by' is the course of the carriage drive on the estate side of the railway line, where a row of very tall lime trees remain and which the new school intend to retain. John Dickinson’s decision to expand his paper making business by building a paper mill in Croxley Green had an initial effect on housing on Scots Hill. 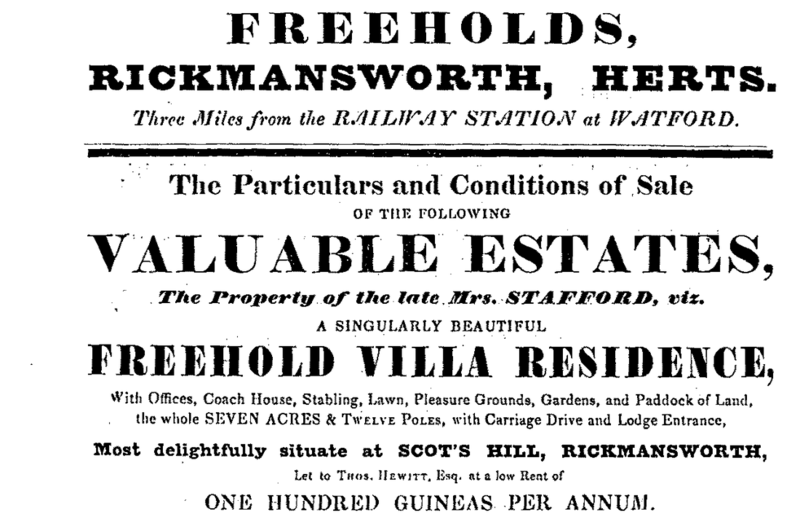 This was possibly due also to its proximity to Rickmansworth. By the mid 1800’s Scots Hill was well established as a village and many cottages, shops and public houses were built – a village was born on the edge of The Green. © Scots Hill c1913-1914. These houses represent just many homes that were built on the hill and at this time was a flourishing part of the village life. 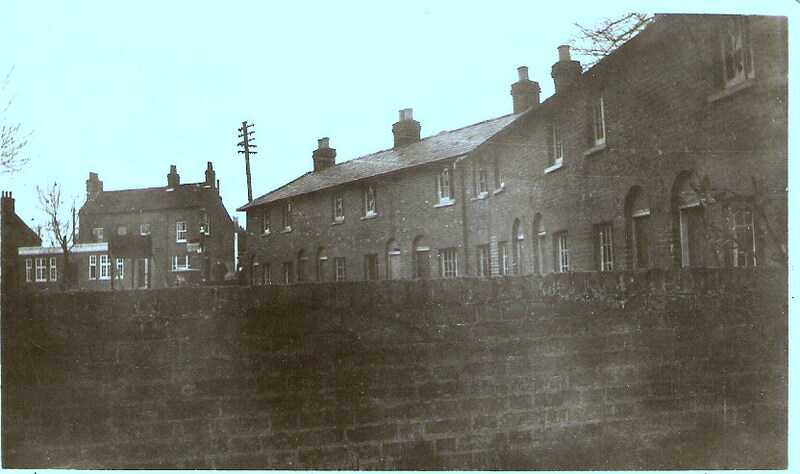 Many of the homes on the left were demolished when the hill was converted to a dual carriageway in the 1970's. However, many of the houses on the right are still inhabited. A closer look will reveal an early motor vehicle that has broken down and is in the process of having a wheel change! An observer appears to be taking an interest in this rare opportunity? 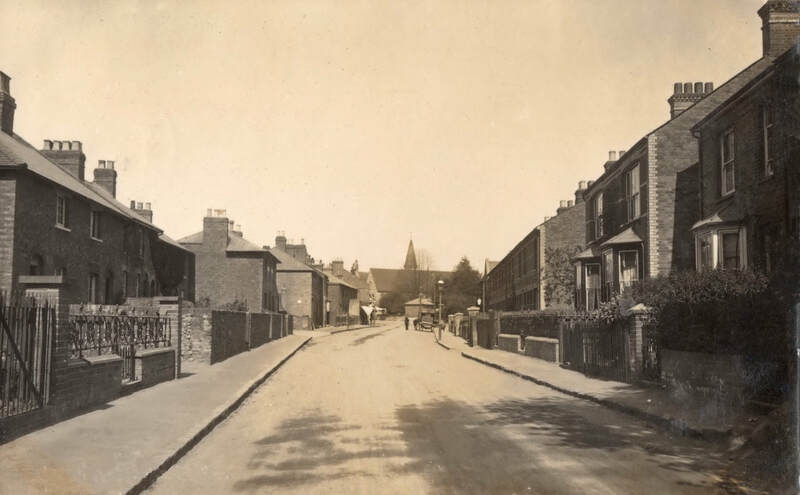 At the top of Scots Hill, Miss Mary Bentley was responsible for the building of the Berean cottages built at the south end of The Green for the elderly of the village. There were ten altogether and they were supposedly built with just a front door. There was a communal wash house and outside lavatories. 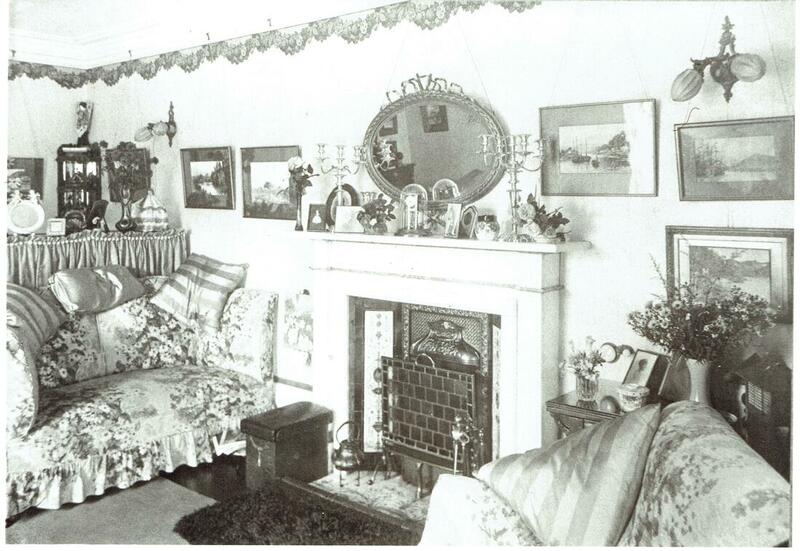 During the early 1900’s as housing conditions generally were improving there was very little scope for the cottages to be improved. 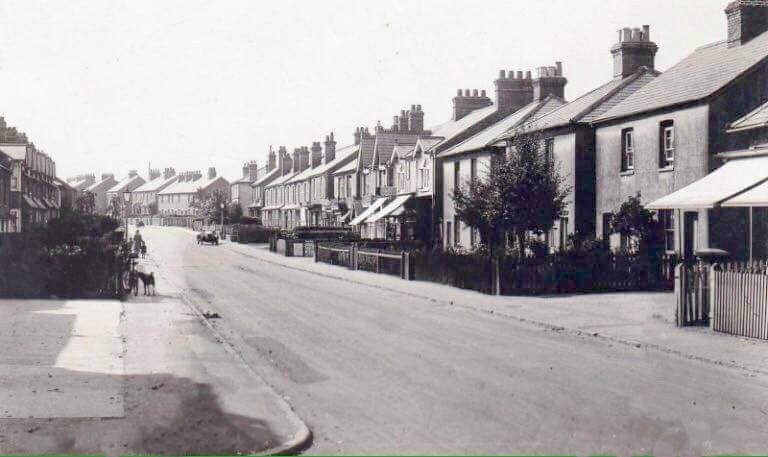 However, they became suitable accommodation for returning soldiers from the First World War and locally were often called Penny Row- the rent charged was one penny- as well as Heroes’ Terrace. © The junction at the top of Scots Hill was a major problem and a mini roundabout was introduced to alleviate the traffic flow. Unfortunately, when the controlled traffic signals during peak times are operated for pupils at the local Rickmansworth School, traffic queues return. This same shop was badly damaged in WW2. The rapid development of John Dickinson’s mill and the resulting job opportunities in the area coincided with the formation in 1849 of The British Land Company Ltd, a subsidiary of the National Freehold Land Society. Its task was to seek land available for building. The company was able to buy large estates which it subsequently divided into areas or plots suitable for sale to prospective builders. 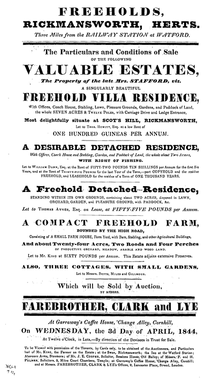 The National Freehold Land Society was then available for the provision of mortgages. In 1860 some 30 acres of land belonging to Hollow Tree House were acquired. The house, still to be found on The Green, had a farm estate that extended towards the Watford Road on one side and a cart track known as Cow Lane on the other side. About this time it was the main thoroughfare which, as the name suggests, was used for taking the beasts from farms north of the village to pasture at Common Moor. 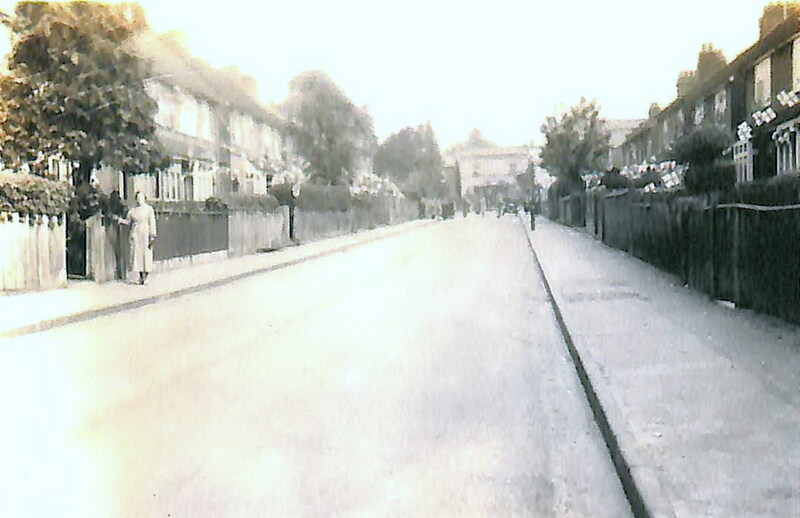 © New Road- c1930's The Co-op shop is on the left and on the right a number of changes from the cottages have been made since this photo was taken. © 100 New Road, Louise Gardens c1932. Mr. George and Mrs. Margery Tilley at their front door. 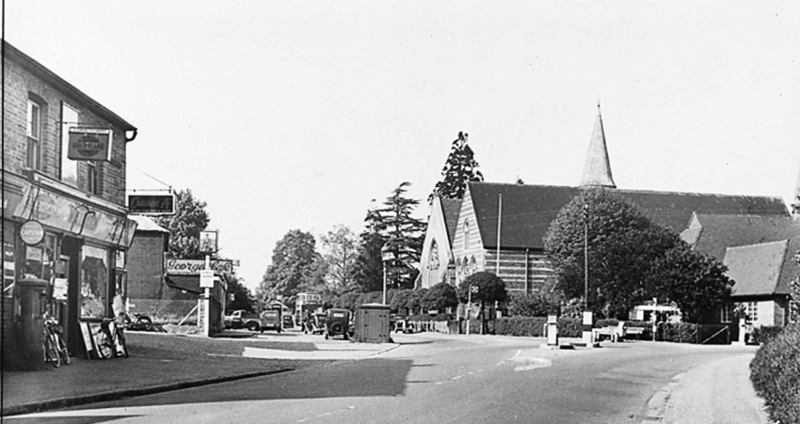 In 1868 a Primitive Methodist Chapel was built in Croxley Green New Road following the increase to the number of worshippers and the limited space in the private house in this road where services were originally held. 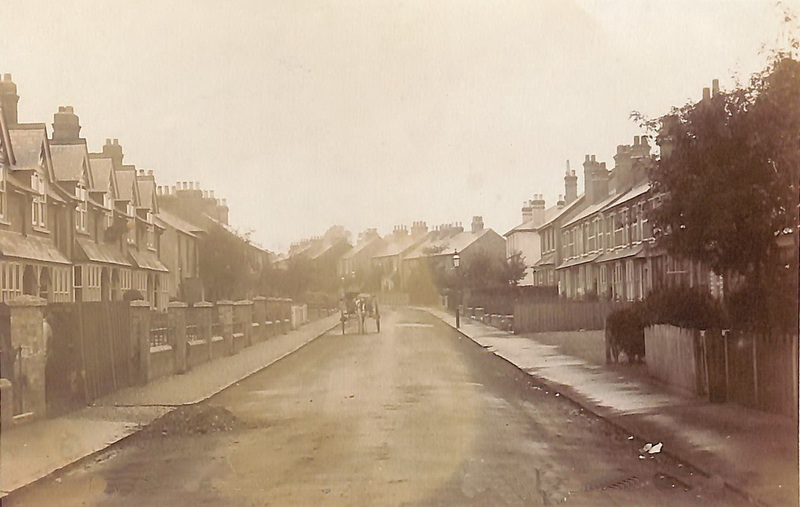 This new development extended the size of the village, the population of which exceeded 1000 during the 1870’s. 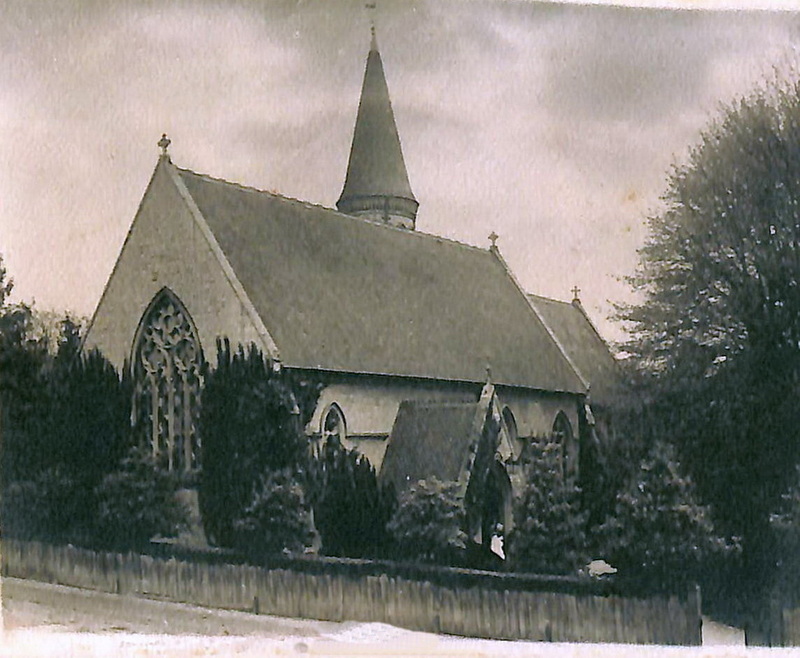 Consequently, the village qualified by reason of its numbers to become a parish with its own parish church. All Saints church was built at the south end of The Green; the foundation stone was laid in 1870 and the building was consecrated by the Bishop of Rochester in 1872. John Dickinson, now a major employer with several sites in the Gade Valley, began a re organisation plan in his business. A large number of the experienced mill workers from Apsley Mill were encouraged to move to work at Croxley Mill. As a result these families required housing. 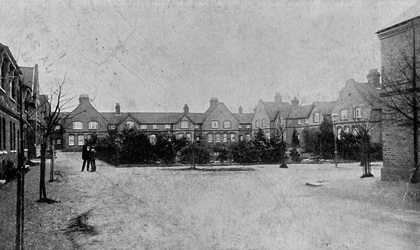 In 1886 John Dickinson purchased land specifically for this purpose from the Salter trustees, close to the village school, situated between New Road and the Watford Road. 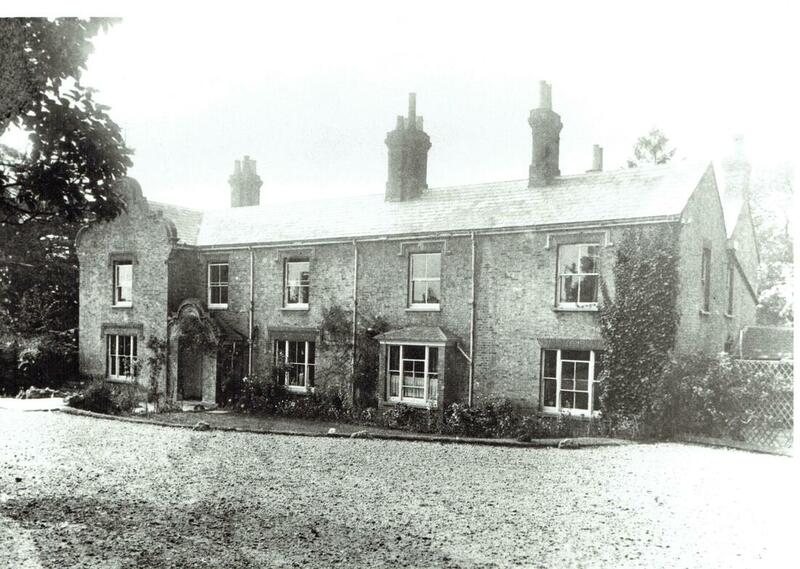 The Salter family, brewers of Rickmansworth had also occupied Hollowtree Farm in1758-and had relinquished the lease in 1759 but still continued to hold land known as the Milestone Field. It was so named because of its proximity to a milestone providing information for travellers. This view is of one corner of the newly named Dickinson Square. It is known that the centre was referred to as 'The Bandstand' and on summer evenings a band would play for the residents. However, it is not known whether this was a area where the 'band stood' as there has so far not been any evidence of a purpose built structure. DO YOU KNOW OF ONE DO YOU HAVE A PHOTOGRAPH to prove this theory? Milestone Field was divided into areas known as ‘coles’: Lower coles six acres; middle coles nine acres. Cole being another name for cabbage which suggests these had been cabbage fields. 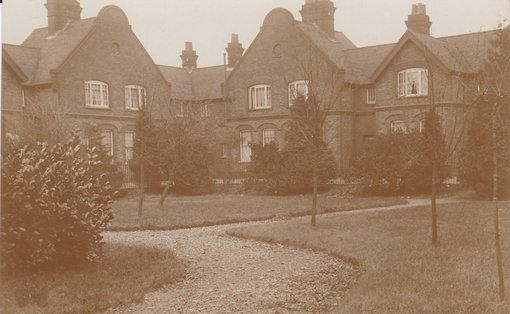 Initially 24 cottages were planned, 20 around a grassed square. The cottages called Milestone Field Cottages were colloquially known as The Barracks, eventually renamed The Square, and housed many of the families transferred from Apsley. On the approach road to The Square from the Watford Road four semi -detached houses were also built. Charles Little, mill manager (appointed in July 1889) lived in 1/2 together with his family and servants including a cook, a nurse and a groom. The mill cashier, James Coutts from Aberdeen lived in No 3. They were built in 1887 and that date was incorporated into the chimney brickwork on the sides of 1 & 2. Water was supplied via a water tower built close by and is thought to have been pumped from the mill. No 5 Milestone Field Cottages served for a short time as a shop, providing premises for a small trading business initially started at the mill and was run by Charles Sear. After converting the cottage to a shop it was managed by Robert Lindsey with a boy assistant George Kingham, later to become manager. The business, in fact a Co operative for the benefit of mill workers, transferred in the early 1900’s to a large purpose built shop in New Road. 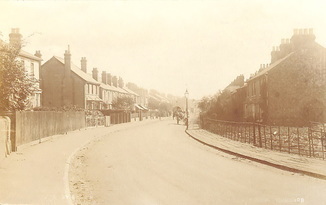 During the 1890’s 30 houses were built parallel to the New Road and Watford Road in what was then known as The Long Row changing to Dickinson Avenue. The Square became an outdoor social centre for the village where residents would gather particularly on summer evenings to sit and listen to the music of a band. A garden competition was arranged with money prizes being offered. The onset of World War I in 1914 meant that many new housing plans were put on hold until 1918 when the war ended. Described by many of the housing developers as the place to live, many claimed that Croxley Green was one of the most desirable residential areas situated in this part of Hertfordshire. From 1920 to the onset of World War II many housing developers looked upon this area potentially as an opportunity to build various styles of homes. The village still consisted mainly of open fields and farmland. Croxley Green would therefore be the perfect place to live in the countryside while also offering the possibility of job prospects due to the development of many prosperous businesses now in the adjoining areas. Rickmansworth Urban District Council RUDC (prior to Three Rivers District Council TRDC) considered many open areas in the district when they planned a programme for building council houses. Very few people could afford to purchase their own homes at that time and renting was the best option. Albert Freeman worked for RUDC (Rickmansworth Urban District Council) from 1895 until his retirement in1936 and had many job descriptions but started as surveyor to the Highways Board. As the housing scheme progressed so did his tasks and he was expected to supervise and oversee several important aspects of the building works. His jobs included sanitary inspector, manager of the gas installations, manager of town planning, advisor to the sewage works at Maple Lodge. The Colne Valley sewerage scheme renamed West Herts Main Drainage Authority in the 1950’s was accredited as his idea for dealing with household ‘waste’ and at that time was considered one of the most advanced in Europe! He would make regular visits to the new housing developments throughout the district and although he had other transport he would mostly travel on his bicycle.